Binge Eating Disorder, written by a clinician and an advocate who have personally struggled with Binge Eating Disorder (BED), illuminates the experience of BED from the patient perspective while also exploring the disorder’s etiological roots and addressing the components of treatment that are necessary for long-term recovery. Accessible for both treatment providers and patients alike, this unique volume aims to explore BED treatment and recovery from both sides of the process while also providing a resource for structuring treatment and building effective interventions. This practical roadmap to understanding, resilience, and lasting change will be useful for anyone working clinically with or close to individuals suffering from BED, as well as those on the recovery journey. "Required reading! 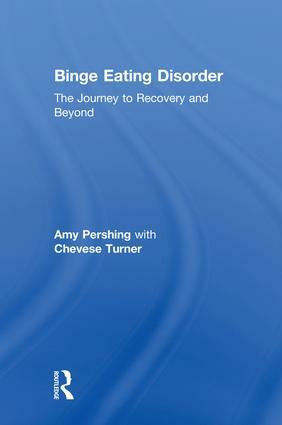 Through personal stories and professional expertise, Amy and Chevese offer a powerful psychological and weight-inclusive understanding of Binge Eating Disorder. It's imperative that professionals understand how to help their clients who struggle with out-of-control eating, and that the millions of people who struggle with BED lose the shame and blame that can accompany this diagnosis. Binge Eating Disorder offers these solutions." "As pioneers in the BED community, Amy and Chevese bring an extraordinary combination of professional and personal wisdom to this field. With profound awareness of the many intersecting factors that can negatively impact recovery, they effectively dispel entrenched myths and offer extensive information and resources for advocacy and support, and ultimately, hope for healing. This book is a gift to anyone seeking freedom from BED and a valuable resource for those who care for them." "Amy and Chevese share their perspectives from decades of experience with Binge Eating Disorder, from survival strategies to recovery; both personal and clinical, solo and community. Their wisdom makes this book rich, rare, and soulful. May we all have access to the communities led by Chevese and access to therapists like Amy." Amy Pershing, LMSW, ACSW, is the founder of Bodywise™ binge eating disorder treatment program and clinical director of the Center for Eating Disorders in Ann Arbor, Michigan. Chevese Turner is the founder of the Binge Eating Disorder Association (BEDA) and a passionate advocate and speaker working to eliminate eating disorders and weight stigma.